We’d love your help. Let us know what’s wrong with this preview of Final Gifts by Maggie Callanan. Through their stories we come t Five years after its first publication, with more than 150,000 copies in print, Final Gifts has become a classic. In this moving and compassionate book, hospice nurses Maggie Callanan and Patricia Kelley share their intimate experiences with patients at the end of life, drawn from more than twenty years experience tending the terminally ill.
To ask other readers questions about Final Gifts, please sign up. I am looking for a book to help me process my mother's passing three months ago. She went through a long illness and we grieved for years already. I am worried that reading this will make me regret things I didn't do/know to do/know to look and listen for before she passed. Is this a book for another time? is it of religious nature? Irene Allison No, it is a deeply heart and human-centered book that forces no ideologies or religions on the experiences it shares. The spiritual aspect of the book…moreNo, it is a deeply heart and human-centered book that forces no ideologies or religions on the experiences it shares. Back when I was a doula, I had this thought that working with women through the birthing process must be similar to working in hospice with people who were dying. I didn't share this thought with many people. In general, I would try not to mention death to pregnant women, and I worried that anyone not involved in doula work might think I was just weird. But to me---next to being born, which for most of us is stored only in our implicit memory and therefore inaccessible with our conscious methods Back when I was a doula, I had this thought that working with women through the birthing process must be similar to working in hospice with people who were dying. I didn't share this thought with many people. In general, I would try not to mention death to pregnant women, and I worried that anyone not involved in doula work might think I was just weird. But to me---next to being born, which for most of us is stored only in our implicit memory and therefore inaccessible with our conscious methods of "remembering"---giving birth was the closest one could get to the process of dying without actually dying. I kept this notion largely to myself and quietly kept my eyes out for people who'd worked with both laboring women and dying people to either confirm or disprove this idea, all the while wondering if I dared try doula-ing to the dying and finding out for myself. "As nurses who care for the dying, we see ourselves as the counterparts of birthing coaches or midwives, who assist in bringing life from the womb into the world. At the other end of life, we help to ease the transition from life through death to whatever exists beyond." The authors go on to draw parallels between the medicalization of birth and the medicalization of death, in which both natural processes were moved out of the sphere of home and family and into the closed-off corridors of medical facilities. Birth and death became events cloaked in secrecy and silence rather than transitions to be experienced surrounded by those who love us. Thankfully, this trend seems to be shifting. Mostly the book is made up of brief accounts of the last moments of dozens of individuals. I read these with the emotion and enthusiasm with which I used to read birth stories in the days before I'd ever attended a birth or given birth myself. I read them hungrily, with the sense that there is a hidden truth in them and that I need only see these stories from the proper angle for this truth to be revealed. The authors point out the similarities between different stories, and encourage the reader to find significance in these similarities. They give suggestions for maintaining the awareness and open-mindedness necessary to receive the often cryptic or confusing messages that dying people sometimes try to convey. They encourage the reader to remember that the dying person is still a person---an individual going through a momentous transition and experiencing a wide range of emotions and sensations that we can only guess at. The authors encourage compassion and connection, and they talk with reverence about the honor of being a part of these families' lives, if only for a short time. This book is for everyone... We all know someone who is dying, has died or is related to someone with cancer or a terminal disease. It is written by a pair of Hospice nurses who documented cases of patients and families of those in the final stages of death. The 'Final Gifts' of the dying are very often missed or refused by the living for fear of looking greedy or uncaring. I learned that the dying know they are dying and we need to respect their wishes. They may want to give you a precious item This book is for everyone... We all know someone who is dying, has died or is related to someone with cancer or a terminal disease. It is written by a pair of Hospice nurses who documented cases of patients and families of those in the final stages of death. The 'Final Gifts' of the dying are very often missed or refused by the living for fear of looking greedy or uncaring. I learned that the dying know they are dying and we need to respect their wishes. They may want to give you a precious item of theirs and the usual reaction is to refuse or tell them they'll be needing or wanting it later. What you should do is accept the gift. That gives the loved one pleasure and peace, knowing their wishes are being fullfilled. I have a dear friend who's brother was dying of a very aggressive form of cancer. The dying man wanted to take his lady-friend, his brother and sister-in-law (my friends) to Disney World and pay for everything. My friend didn't want to go for a few reasons. He thought it was too much for his sick brother to travel and he wouldn't hear of him paying for the whole trip. He said he would pay for himself and his wife if they decided to go. I had recently read the book and told him he should let his brother pay for everything and go! I explained that it was his brothers Final Gift to him. Eventually, he agreed to go. The trip was very difficult and the two brothers spent the entire trip in the hotel room while the women went to the parks. Within weeks after returning the brother passed away. I am a volunteer in a program at MetroHealth System in Cleveland, OH, USA called No One Dies Alone. I read this book as part of the orientation and training we receive prior to caring for patients. The authors, experienced hospice nurses, speak to the many ways that people can be present to the dying (and their loved ones), and in so doing help the dying find peace in their final days and hours. They discuss the many issues that dying people often want to resolve or communicate, and how the dying I am a volunteer in a program at MetroHealth System in Cleveland, OH, USA called No One Dies Alone. I read this book as part of the orientation and training we receive prior to caring for patients. The authors, experienced hospice nurses, speak to the many ways that people can be present to the dying (and their loved ones), and in so doing help the dying find peace in their final days and hours. They discuss the many issues that dying people often want to resolve or communicate, and how the dying often do so in non-obvious ways. They also demonstrate, through their stories, how to communicate with the dying in a generous but direct way as they approach death. The first several chapters are a brief exploration of the theory that forms the foundation of the practice they have developed over the years they have worked with the dying and their families. They speak to the Nearing Death Awareness that the dying develop, and how family and friends can spot the manifestations of that awareness and serve as guides and allies to the dying. The rest of the book is mostly stories of patients they have cared for. The authors use stories both to illustrate dying as the conclusion to life and to reinforce the practices that anyone can use to accompany the dying through their final days, hours, and moments. There is a deep beauty in this book. It caught me by surprise. I was expecting to be somewhat depressed by so many stories of death. And while it is true that I felt great sadness and shed many tears while reading the book, every time I finished a story, I was uplifted by the gift of kindness, compassion, and love that the people close to the dying person were able to find in themselves even as they experienced the sadness and stress of losing someone they love, and to see that kindness, compassion, and love reciprocated. In the end, at least for me, the book is as much about living as it is about dying. (The authors make the point that many of the urgencies that the dying feel - achieving reconciliation, for example - can be addressed while we are still healthy and very much alive.) It is a soul touching and a soul stretching book, quite worthy of your time. I have purchased and given away SO many copies of this book! When my own mom was in Hospice House, the nurses recommended this book to all of us girls (me and my 3 sisters). When people have terminal illnesses they often share experiences and the people they see as they make their journey to the next life. Unfortunately, many friends and family members will write-off these experiences to "the meds" or "their illness." This book helps you open your eyes and heart to these "FINAL GIFTS" that the d I have purchased and given away SO many copies of this book! When my own mom was in Hospice House, the nurses recommended this book to all of us girls (me and my 3 sisters). When people have terminal illnesses they often share experiences and the people they see as they make their journey to the next life. Unfortunately, many friends and family members will write-off these experiences to "the meds" or "their illness." This book helps you open your eyes and heart to these "FINAL GIFTS" that the dying give to you when they share these experiences. After reading this book, we were very open-minded. My mom began to share beautiful things with us. I used to be afraid of death - not any more. I know one day my mom will come back to help me with my transition. This book is, quite simply, the most helpful thing I have read this year as I continue to cope with my parents' declining health. It is just uplifting enough to make me fear the entire concept of death less. It is just reality based enough for me to buy into the content. The authors are hospice nurses who have witnessed more death than the average person. Throughout their years working in close proximity with dying patients, Callahan and Kelley began to take notice of certain patterns of behavio This book is, quite simply, the most helpful thing I have read this year as I continue to cope with my parents' declining health. It is just uplifting enough to make me fear the entire concept of death less. It is just reality based enough for me to buy into the content. The authors are hospice nurses who have witnessed more death than the average person. Throughout their years working in close proximity with dying patients, Callahan and Kelley began to take notice of certain patterns of behaviour and need. Final Gifts is the result of their direct observation of hundreds of people experiencing the end of life. I am not religious in any organized sense and derive little comfort in the standard methods used to console the grieving. However I am open minded enough to believe that there is more than what we experience in the here and now. Perhaps this is why Final Gifts touched me and gave me such hope. Individuals from all walks of life...religious and non religious...are all described as finding comfort and peace as they died. Most reached out to others whom the survivors and the medical team could not 'see'. The patients appeared to be reconciled with loved ones who had died before them. They were described as being happy and ready to go. We have no idea if these visions and peaceful feelings are based in our neurology or based in something more. But, personally, I don't think it matters. If the experience feels intensely real to the dying individual and it is their final experience...then it becomes 'real'. Final Gifts made me believe that I have the power to help my loved ones achieve a more gentle and peaceful death. I cannot prevent them from leaving me. But I can respond in ways that will help ease and comfort them. And stories like the ones presented in this book give me hope that my own passing can also be natural and free of fear. It makes me even more angry and distraught to contemplate our violent society. It appears that death can be a beautiful transition if the individual is being nurtured...if pain is being managed...if family and friends are at the bedside...and if there has been sufficient time for the dying person to put affairs in order. Although these stories offered me much solace, they also made me feel anger on behalf of all the people who die alone and in pain. Or whose lives are taken suddenly and violently. Apparently there is really such a thing as a 'good death'. Just like a 'good life', half of it is based on circumstance. For those of us who will have time to say goodbye to our loved ones and who will be cared for at the end by compassionate people such as the authors of this book, a 'good death' is within our reach. I read a book about dying. I'd been trying to avoid it - my mom loaned it to me a year ago, after my dad died. I was scared of it. BUT MAN, this book was actually really uplifting. It's amazing the things I saw my dad do in his final weeks - talking about "going home" and grabbing his luggage bag, and talking about seeing St. Peter and his parents, who have died - how this is something many, many dying people do - no matter their age, culture, disease, medications, etc. I realize...this is weird. I'd been trying to avoid it - my mom loaned it to me a year ago, after my dad died. I was scared of it. BUT MAN, this book was actually really uplifting. It's amazing the things I saw my dad do in his final weeks - talking about "going home" and grabbing his luggage bag, and talking about seeing St. Peter and his parents, who have died - how this is something many, many dying people do - no matter their age, culture, disease, medications, etc. It gave me an enormous piece to hear that no matter the religion, many people see a "Supreme being" and angels or people who have passed away when they're nearing death, and they have peace. It isn't a Christian book, but my word did this strengthen my faith. One of the most frustrating things about being with a person who's dying is a sense of helplessness combined with ignorance. What is the person feeling, what does he WANT, are some of the things he says delusional or do they have a greater meaning? This book helps answer many of those questions, and gives clear examples of these things. If you will be spending time with a person who is nearing death, I highly recommend this book. And for all that many people find death depressing, I have to say I One of the most frustrating things about being with a person who's dying is a sense of helplessness combined with ignorance. What is the person feeling, what does he WANT, are some of the things he says delusional or do they have a greater meaning? 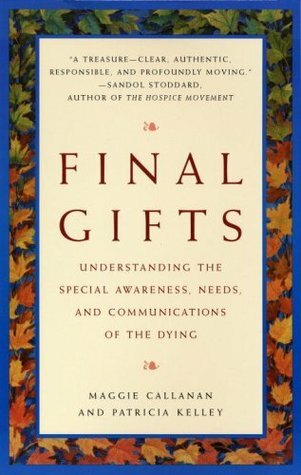 Final Gifts was written by experienced hospice nurses in 1992 so it is a bit dated but, in my opinion, the majority of the information remains timeless, extremely relevant, and helpful. The stories shared by these caring nurses were so interesting and focused on Nearing Death Awareness, which is "a special knowledge about--and sometimes a control over--the process of dying. [It] reveals what dying is like, and what is needed in order to die peacefully; it develops in those who are dying slowly." Reading this book strengthened my own beliefs about my mom's death. First of all, she told me that "someone" told her she only had 3 more days to live (and that "someone" was eerily correct). Secondly, she asked for my permission to stop fighting and to let go. Saying yes was the hardest thing I've ever done in my life, but I knew it was best for her and that she deserved peace after being in pain for so long. Lastly, I believe she chose when to die. When all of this was happening, I felt confused and wanted to know who the heck would have told her she only had 3 days to live. After reading this book, however, I've come to understand that what I had guessed to be true probably was. Many dying people can predict their own death and even choose when to die. After being admitted to hospice, my mom died within just 32 hours, which didn't give my brother and I enough time to visit from out of state. We had, however, visited just a couple weeks earlier, exchanging meaningful conversation both in person and on the phone during the time in between. I now believe she did indeed choose to die alone to spare us the pain of being there. Lastly, by not lingering, she died more than a week before my birthday and more than 2 weeks before her grandsons' birthday. After reading this book, I am more convinced than ever that she chose to die alone and on a particular date as far from our birthdays as possible. Although this book was very sad (I read most of it with tears streaming down my face), it was also reassuring, comforting, and even hopeful. So, while I can't say that I was totally "ready" to read it, I'm glad I finally did as it provided me with some peace knowing my mom did all she could to shield us from her death (proving her immense strength yet again). Love and miss you forever, mom. What an amazing book! I was speechless and had to stop to intellectually and emotionally process the material presented several times during the book. This book is a compassionate and clear rendition of a difficult topic, a serious challenge to the heart and mind, and a must read for anyone with ill or aging family or friends -- at any time during life. Actually, the book is for everyone.....as we will *ALL" be a "final gift" one day. If you struggle with how a loved one passed away or if you simply want more insight into the sometimes strange and beautiful conversations had with the moribund, you will get a lot out of this book. This read was recommended to me by my partner's therapist after he died. Have tissues with you at all times. Accurate and excellent information on understanding those who are in the dying process. It is a process and one that if we are educated on, can turn the experience into a more rewarding & beneficial journey for those who are at end of life and those who care for them. This book really helped me prepare for my dad's death. This was an insightful, sad, educational and heartwarming book as I begin my journey as a hospice volunteer. I found this fascinating. The stories of the ways the dying can communicate are kind of amazing (occasionally to the point that I doubted the authors a bit...but then again, they've had years of experience and have clearly heard it all). I also appreciated the stories about situations when they couldn't satisfactorily interpret the dying person's wishes, and how everyone coped with that. It has me inspired to listen all the more attentively as my mom declines. Amazingly helpful in letting go of a loved one. Highly recommended! This book has given me tremendous insight as my dad nears the end of his life. I feel more compassionate and understanding and have some direction amongst the myriad of emotions at this time. If you're looking for a book with pat page-and-a-half stories of people making their peace and then joyfully passing on, this is the book for you. "I hadn't talked to my daughter in 20 years, but those last two weeks we grew closer than we ever had before. Fin." Any story in this book that presented a modicum of complexity is glossed over or truncated. There is nothing in here that speaks to people who die angry, or without resolving their issues. There's nothing in here that deals with the com If you're looking for a book with pat page-and-a-half stories of people making their peace and then joyfully passing on, this is the book for you. "I hadn't talked to my daughter in 20 years, but those last two weeks we grew closer than we ever had before. Fin." A friend gave me this book when my mother was dying, and it was a tremendous comfort to my family. The authors drew from their hospice experience to explain a lot of what happens when people are in the last stages of terminal illness, and to help their families understand what's happening and how they can best help and support their dying loved ones. I recommend this to any family coping with the dying process. Two hospice nurses share experiences and stories dealing with the process of dying. They specifically define and describe "Nearing Death Awareness" and discuss the signs of imminent death. They explain how one can grow from being involved in the process as a caregiver or family member and how to help the individual who is dying to do so with dignity and peace. I found the book helpful and comforting. This is the second time I have read this book. It takes you on an amazing journey with those who have experienced Nearing Death Awareness. It has helped me be more aware of my own feelings and those around me during the difficult time prior to death. I hope to use the true stories in this book to stay peaceful and calm - knowing that death will eventually come to us all. Don't want to be maudlin, but this is a very special book about a very difficult subject. Wow! This book gave me a lot to think about. I read it just before going to be with my mother as she begins hospice care. I found the information so important I purchased copies for my family members. I like to think my reading this book will benefit my mother, family members, and myself. Thanks to the authors for writing about a topic that is so very difficult to talk about. This book really helped me to see death as an important part of life. It's something we all have to do and often have to help others through. Despite the subject matter, this is a very uplifting and satisfying book. The author (if I remember correctly) is a hospice nurse who takes a personal approach, using touching examples from her life and work, to illustrate important concepts.